Think about laying up on your roof getting a tan or watching the stars, that would be sweet! 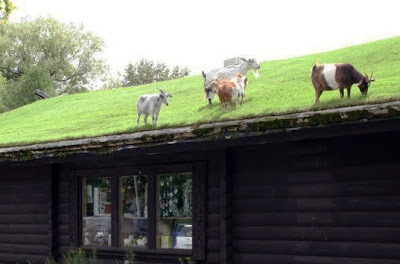 Check out more pictures at Inhabitat.com of how architects are designing green roofs. Hopefully green roofing won't make our cities look like Hobbit towns, or Teletubbie houses. The folks at AM Construction were great. Not only was the patio doors of superior quality for the price, but they had great customer service to go with it. The sales experience was not aggressive at all and the installers were clean, professional, and willing to do a little extra to make sure everything looked perfect www.amconj.com. Depending on the age and condition of your roof, completing repair work can extend the life of your roof at a fraction of the cost of a full replacement…. As professional roofers, we work hard to provide you with an effective solution that won’t require you to buy a new roof. Getting a cold? Make ginger tea! Saturday Night Live | Conspiracy Theory Rock!